Founded in 1984, Jentner is a nationally recognized investment management firm with a history of helping organizations serve as good stewards of their resources by protecting and growing their funds. Our proven, cost-effective investment strategy focuses on earning meaningful returns for clients over the long term while continually providing confidence in one’s investments, making for a successful investment experience. 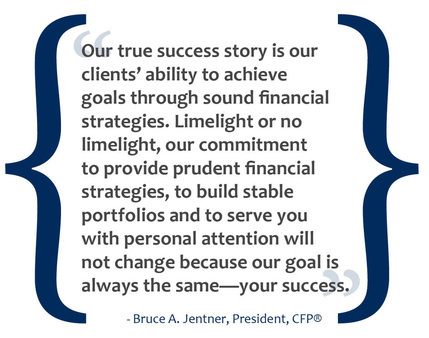 Jentner is continually recognized for exceptional stability and growth in its clients’ portfolios. The ongoing recognition is evidence that our proactive management strategies not only stand the test of time but also stand the test of the market. Jentner Wealth Management is often featured in leading financial media. The Wall Street Journal wrote a feature article on Jentner in 2015, discussing how we create globally diversified, low-cost portfolios and explained why we regularly rebalance our clients’ portfolios. Worth magazine identified President Bruce Jentner as one of top 250 financial planners in U.S.
Financial Advisor, InvestmentNews, and ThinkAdvisor continually rank Jentner as a top fee-only registered investment advisory firm.